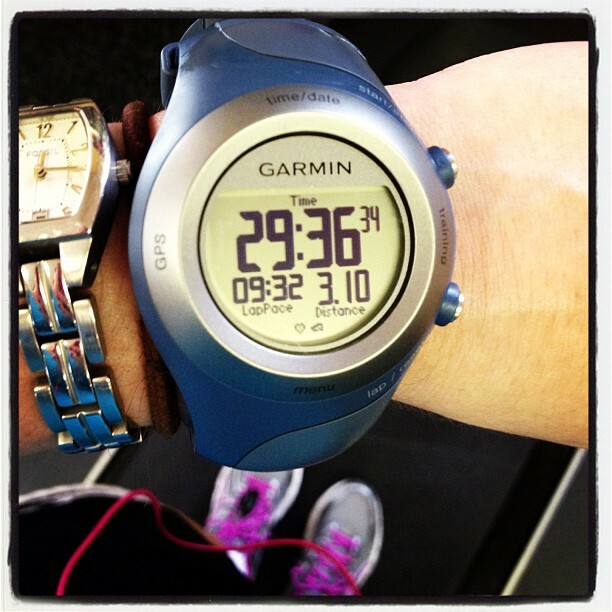 I had a decent run today – I ran a 5k distance on the treadmill. I really had to push myself through the run. I think I proved my observation from last week that I have much better runs when I do them first thing in the morning. Today I slept in a bit, had breakfast and went for a run in the early afternoon. Occasionally, I like to look at my heart rate averages and maxes (my garmin watch has computer software that records it). Whenever I’ve had a great run, my max heart rate and average heart rate are always significantly lower than on a day like today, where I really had to push myself through the run. I guess one way to look at it is even though I didn’t run as far, I probably got just as good of workout because my body had to work harder to complete the shorter run. Hopefully one day, I will figure out all of the factors that contribute to a good run for me! This afternoon, I decided to use up all the kale we had begging to be consumed in our fridge and make kale walnut pesto! 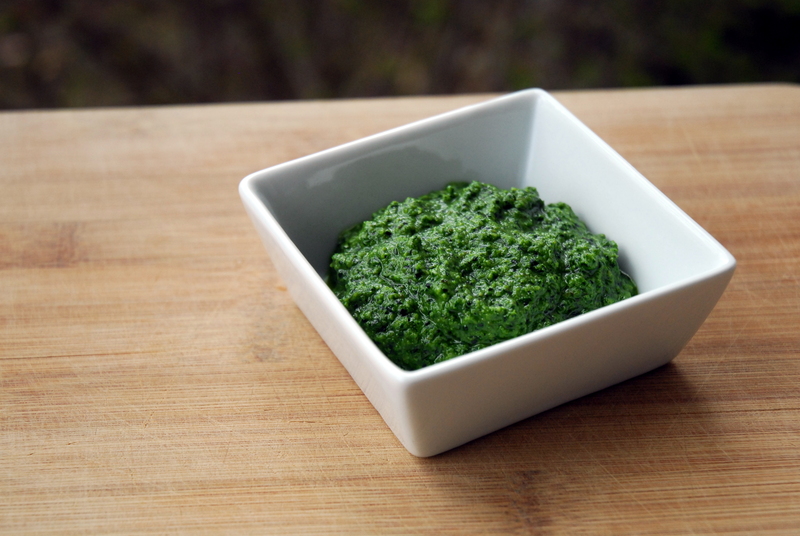 I’ve been wanting to make kale pesto for a while. 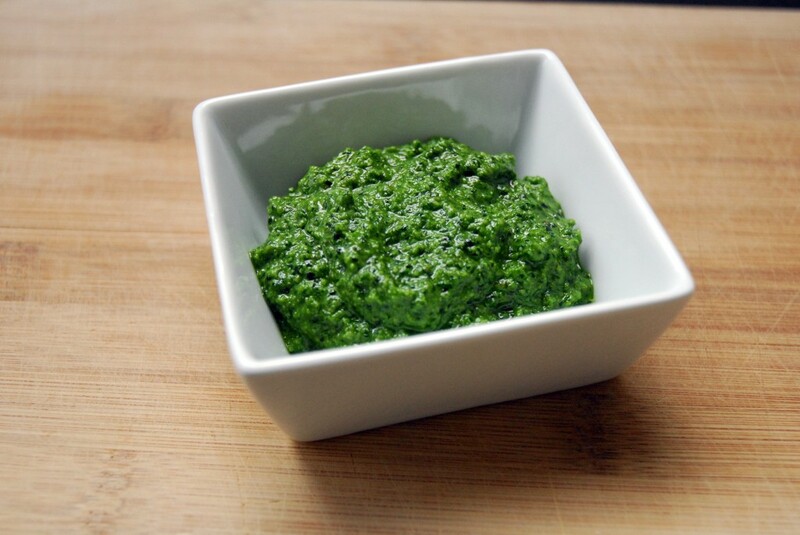 I love basil pesto (that’s how it’s normally made). I was a bit weary that this pesto would taste too much like kale, but I honestly can’t tell the difference! Pesto is very versatile, so it’s a great thing to have on hand in your fridge or freezer. You can spread it on just about anything, use it as a sauce – the list goes on and on! I have some creative ideas for recipes using my pesto. Hopefully a few will work and I can share them this week. This Kale Walnut Pesto comes together pretty quickly – the hardest part is chopping the kale! 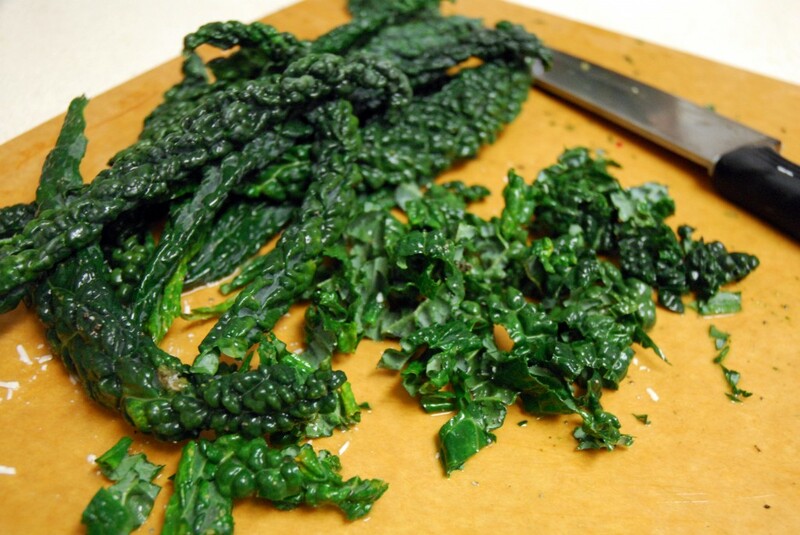 Chop your kale and remove the stems. 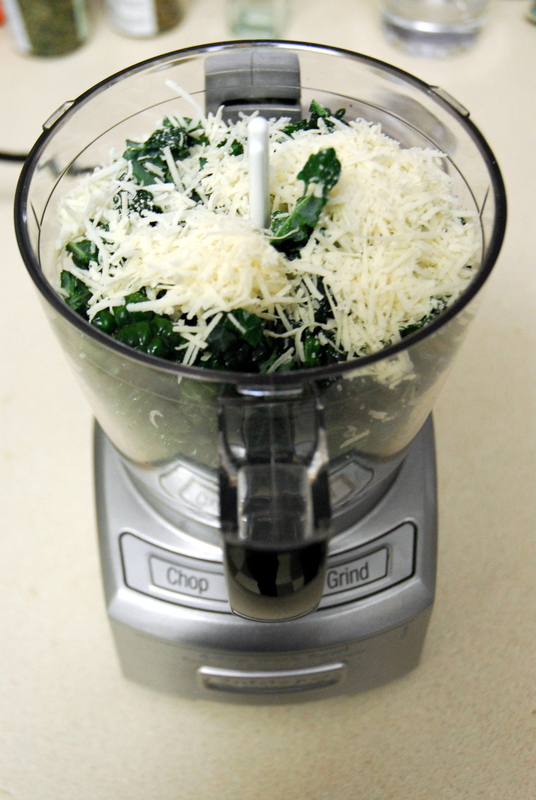 Add half of the kale, parmesan, garlic, walnuts and basil in a food processor and chop until well combined. Then add the rest of the kale and chop until well combined again. Add the lemon juice, put the top on and gradually add the olive oil through the top of the food processor. 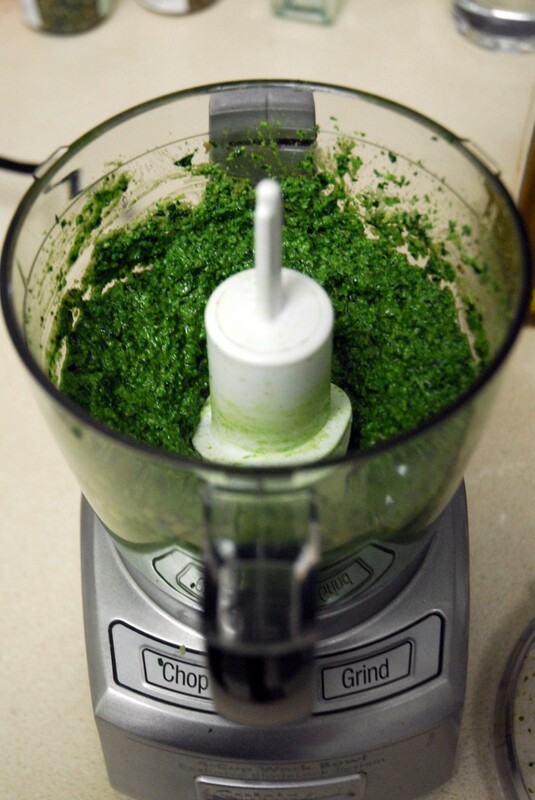 Blend until it’s at your desired consistency for pesto. Then season with salt and pepper and blend one last time until well combined. 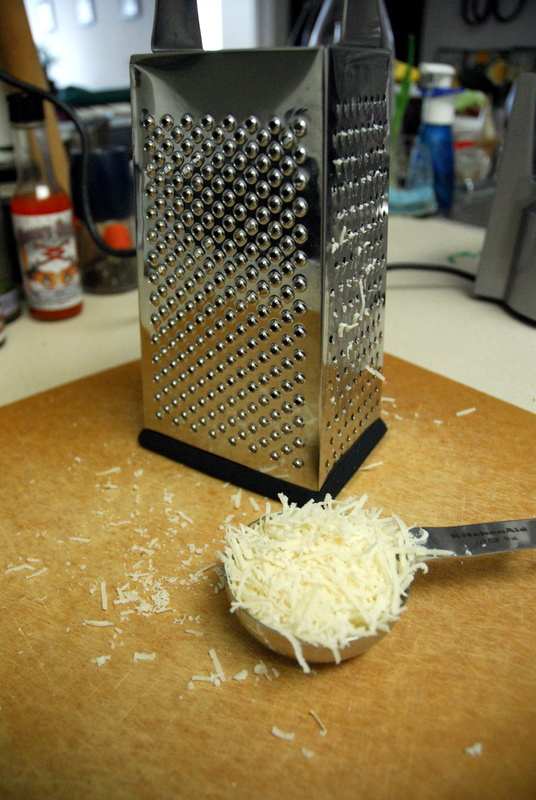 Grate your parmesan and chop your kale (just the leaves, no stems!). Put half of the kale, parmesan, walnuts, garlic and basil in the food processor and chop until well combined. Add the rest of the kale and chop until well combined again. You may need to use a spoon to push everything down before chopping again. Add the lemon juice, put on the top of the food processor, and gradually add the olive oil through the top of the food processor. When the pesto is the consistency that you want it to be (add more olive oil if you need to), add salt and pepper. I would start off with a little salt and add more if you need to – remember you can always add more salt but never less! 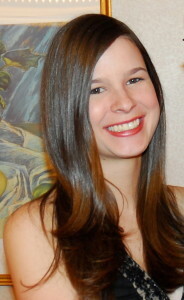 This entry was posted in Fitness, Gluten-free, Recipes, Running, Sides, Vegetarian and tagged kale, pesto, recipes, running. Bookmark the permalink. Your 5k was more successful than mine – congrats girl! Great time 🙂 This looks amazing too – I’m a huge pesto fan, and of course, any way to sneak in extra leafy greens is a winner! Thanks! But, keep in mind this was on the treadmill – I’m planning to get another outdoor run in this week. We’ll see how that goes! I made this pesto a long time go but completely forgot about it- thanks for the reminder! I remember really liking it! You’re welcome 🙂 It’s so good!